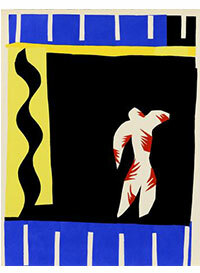 Lyon: "Henri Matisse, the interior laboratory"
at the Musée des Beaux-Arts. Throughout the life of Henri Matisse, drawing occupies a central place, both in the diversity of its means and its supports. This assiduous practice in the intimacy of the workshop was the laboratory of his work as a painter, as well as his sculpture. Matisse’s drawings surround, precede, accompany or extend the other artistic forms, and sometimes also constitute themselves in independent constellations. The exhibition presents 250 works and accounts for the main moments of this journey articulated in both thematic and chronological sequences, from the years of apprenticeship to studies for the chapel of the Rosary in Vence, the ultimate masterpiece and a lifetime culmination for Matisse. This exhibition is supported by the Center Pompidou as part of its 40th anniversary. Milan: "Extinct in the Wild" at the Fondazione Prada.